In this impersonal technological era, a unique wedding cake is the rage. 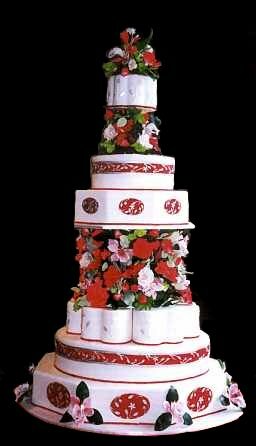 Couples are personalizing their wedding cake beyond mere decorations, choosing the flavor, color, size and shape of a cake. Ursula Argyropoulos, owner of Ursula Art of the Cake, said brides and grooms routinely request a cake that reflects their lives. "It's really a statement of who they are", said the Boston wedding cake specialist. And wedding cakes are being stacked taller and taller, though there's been no return (thankfully) to pillars.